The Babblers hit the road to Montana for a memorial visit to honor Eric’s stepmother. Along the way, we visit all sorts of Americana, from oddly shaped water towers to a ghost town inhabited solely by deteriorating animatronic citizens. This episode is brought to you by Laughter and Tears. We may babble about movies, but that hasn’t kept me from posting other odd adventures we’ve had over the years. 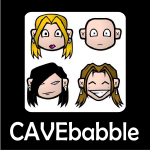 The handful of travel episodes I’ve produced are among our favorites, and best represent the time capsule of experiences Amber and I envisioned for Cavebabble seven years ago (as of September 22). They were grueling to edit, but completely worth it. I’m sure they always will mean much more to us than to our listeners, but I’ve tried to keep them funny and interesting. If you would like to enjoy one of these episodes, I’ve gathered the links here, so that you don’t need to scroll through our feed, searching for them yourself. I hope you hear something you enjoy. The Great Babbling Road Trip takes Eric and Valerie driving from Missouri to Montana, and back again, recording odd things along the way. Also includes three Cavebabble Eats Odd Things. This episode is brought to you by Nothing To The Horizon.